The most exciting panoramic view ever! Looking for the most spectacular panoramic views of the entire city of Paris? A visit that includes a complete 360° view? Then you should visit the Montparnasse Tower and give yourself the chance to discover the city in all her splendour. You will climb to a height of 210 metres at which point, you will be able to see the amazing spectacle that is Paris!In addition to this experience, with tickets that enable you to "Jump the Queue" you will go straight up to the 56th floor, thus avoiding the long waiting times at the ticket booths. The Montparnasse Tower is situated in one of the most famous districts of Paris, Montparnasse. When visiting this famous bohemian district, you won't be able to ignore the characteristic and utterly imposing Tower of Montparnasse. Your attention will be completely absorbed by the sight of this immense tower and that is just the beginning because, the real spectacle comes into focus from the observation deck on the 56th floor from whence you can see Paris in all her splendour, including the iconic Eiffel Tower. What is the best time to visit the tower? Many people say at night, so that you can see the spectacular city lights and the illuminated Eiffel Tower. 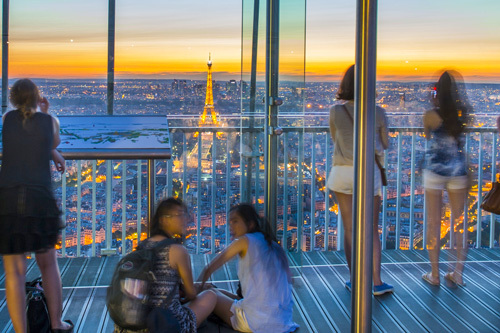 However, the truth is that any time of day is perfect for admiring the capital of romance from the Observation Deck of the tower in Montparnasse. If you want a break with a taste, you can pop in to the panoramic bar for some refreshments and if you are looking for somewhere to have lunch or dinner after your visit, we would recommend that you have a stroll along the street that is famous for its crêperies, Rue Montparnasse. On this famous street, you will find plenty of places that serve tasty and delicious traditional crêpes. Buy your tickets on-line and jump the queues for access to the tower. You can show your tickets at the entry on your mobile 'phone so there is no need to stress about having to print the tickets. Get into the fastest lift in Europe and in just 38 seconds, you will arrive on the 56th floor of the tower. Thanks to the indicators showing the main points of interest, the films, the interactive activities and the exhibitions, you will find out about the French capital in minute detail. Continue your visit by going up to the open-air observation deck on the 59th floor which is 210 metres above ground level. Here you can enjoy views that will take your breath away and you can then relax afterwards with a tasty snack in the panoramic bar. Entry at whatever time you wish (opening hours can be found below). On the day of your visit, just show the tickets on your smartphone and Jump the Queue. You will access the Montparnasse Tower from the side on Rue de l'Arrivée. In order to reach the Montparnasse Tower, you can use lines L6, L8, L12 and L13 to get there and will need to get off at the stop Gare de Montaparnasse, or you can get off at the bus stop of the same name on lines 28, 58 and 91. The Montparnassse Tower can be visited every day of the week. The opening times do change according to the season and it is important to bear in mind that the last lift in order to reach the terrace, leaves 30 minutes before the tower closes. From the 1st of October until the 31st March: from Sunday to Thursday: 09:30 to 22:30 hours, on Fridays and Saturday: from 09:30 to 23.30 hours.